When minerals, rocks, and fossils cannot be accurately identified by macroscopic observation and testing, thin section slides can reveal the composition and structure of the specimens on a microscopic level. 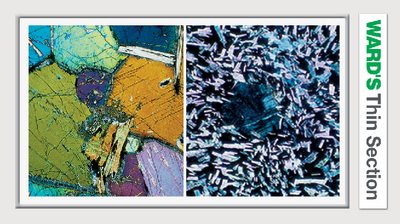 Thin section slides are precisely ground to a thickness of 0.03 mm across the entire specimen area. Mineral and rock thin sections are mounted on 27 x 46 mm microscope slides, and protected by a glass coverslip. All thin section slides are labeled for reference.